Kabul, Afghanistan (CNN) — The United States gave $860,000 to the families of people in Afghanistan killed or wounded in a shooting rampage that is being blamed on U.S. Army Staff Sgt. Robert Bales, two Afghan officials said Sunday. The money includes $50,000 for each of 16 people who were killed, as well as $10,000 for each of six who was injured, the provincial council members said. A U.S. official confirmed Sunday that a payment had been made on Saturday. “I can’t comment on the figure, but I can say that it reflects the devastating nature of the incident,” said the official, who asked not to be named because of the sensitivity of the situation. Military investigators now believe Bales committed the shootings during two separate trips off his base, a separate U.S. official told CNN Sunday. “We believe the shooter went to one village, came back and went to a second village,” the official said. The official, who would not speak on the record because the investigation is ongoing, said the conclusion was based on factors including interviews and the overall investigation. The American official who handed over the money to the families said it was not compensation, but the U.S. government offering to help the victims and their families, Kandahar provincial council member Haji Nyamat Khan said. But a spokesman for NATO’s International Security Assistance Force, Col. Gary Kolb, said the money was compensation. It was not immediately clear if the word used to describe the payment had legal significance in Afghanistan, where “blood money” can replace a trial or punishment of a killer. Afghans are insisting that the suspect be returned to Afghanistan to face trial, with villagers and lawmakers questioning the U.S. military’s account of what happened. But a military official in Afghanistan has said that Bales will be tried in the United States. Khan, the local official, said the money was paid in Afghan currency and handed over in Kandahar city. He did not name the American official involved in the meeting. Bales has been charged with 17 counts of murder, and could face the death penalty if convicted of any of them. Authorities say Bales left a remote outpost in Kandahar province’s Panjwai district early March 11 and went house-to-house, gunning down villagers. U.S. and Afghan officials initially said 16 people died in those attacks. But Kolb, the ISAF spokesman, said Friday that investigators assigned to the case felt they had evidence to charge Bales with 17 counts of murder. 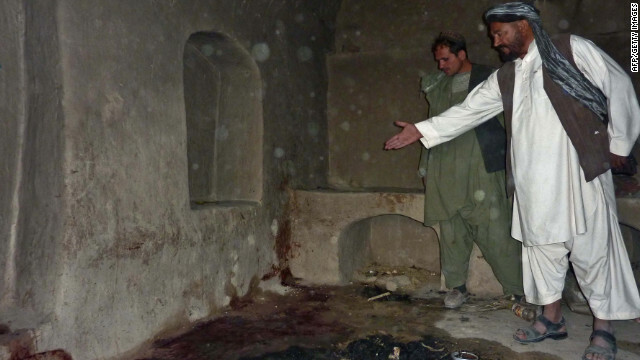 The charge sheet accuses Bales of killing four women among 17 victims, while initial U.S. and Afghan reports listed three women among the 16 dead. Afghan government officials in Kabul have said they have no record of another death. Afghan officials say nine children, three women and four men from at least four families were killed in villages in Kandahar province on March 11. They were Mohammad Dawood Abdullah, Khudaidad Mohmmad Jama, Nazar Mohammad Taj Mohammad, Payendo, Robina, Sahtarina Sultan Mohammad, Zuhra Abdul Hameed, Nazia Doost Mohammad, Mosooma Mohammad Wazir, Farida Mohammad Wazir, Palwasha Mohammad Wazir, Nabia Mohammad Wazir, Asmatullah Mohammad Wazir, Faizullah Mohammad Wazir, Esa Mohammad Mohammad Husain, and Akhtar Mohammad Murad Ali. Four children, one woman and one man were wounded in the attacks, according to the charge sheet against Bales. Two of the wounded were released from the hospital Thursday, according to Ahmad Javed Faisal, a Kandahar government information spokesman. Bales, who was returned to the United States last week, is being held at Fort Leavenworth, Kansas. It is not clear whether he will now face a military procedure known as an Article 32 hearing, at which military authorities would determine whether to proceed with charges against him, or whether he will go before a group of experts to determine whether his mental health may be a factor in his defense. If and when the case comes to trial, Bales’ lawyer, John Henry Browne, said, it is going to be “extremely difficult” for the prosecution. Military law experts acknowledge that proving the case may be difficult, especially given that there are no autopsies to help prove the cause of death — in part because those killed were buried quickly, in accordance with Islamic tradition — and difficulty in getting witnesses to testify.